Today VetsAid, Joe Walsh’s national 501(c)3 non-profit, announced the disbursement of $795,000 in grants to veterans services organizations with money raised from their 2nd annual concert event which took place on Veterans Day 2018 at the Tacoma Dome and featured performances by Walsh, Don Henley, James Taylor, Chris Stapleton, Haim and a special appearance by Sir Ringo Starr (Video Recap package available below). 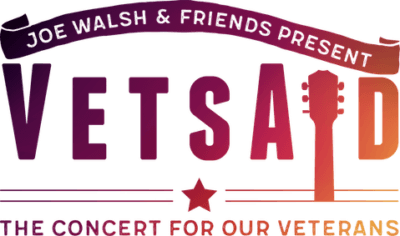 This is more than twice the amount given away last year; VetsAid disbursed $360,000 in grants after its inaugural concert on September 20, 2017 at the EagleBank Arena in Fairfax, VA featuring performances by Walsh, Zac Brown Band, Keith Urban and Gary Clark Jr.
VetsAid divided the proceeds from the 2018 concert event into large and small grants, awarding 9 large grants of $75,000 to larger national charities and 12 small grants of $10,000 to smaller local/regional groups with a focus on the host region – in this case, Washington state. All recipients were chosen by Walsh and the board of VetsAid with the advice and counsel of the National Association of Veteran-Serving Organizations (NAVSO). Grant applicants must all be recognized 501(c)3 non-profits that take care to provide complete and holistic care for veterans and their families, physically, mentally, emotionally and/or spiritually. This year’s $75,000 grant recipients are: Operation Mend, Hire Heroes USA, Warrior Canine Connection, Tragedy Assistance Programs for Survivors (TAPS), Semper Fi Fund, Children of Fallen Patriots Foundation, Stop Soldier Suicide, Midwest Shelter for Homeless Veterans and Sentinels of Freedom. This year’s $10,000 grant recipients are: Suiting Warriors, Hire Our Heroes, AMVETS Department of Washington, Salmon for Soldiers, Hero’s Bridge, Right Turn for Yuma Veterans, Work Vessels for Vets, Arkansas Run for the Fallen, MusicWorks4Veterans and HeartStrides. VetsAid also awarded a $10,000 grant to Operation Good Jobs/Goodwill WA for its assistance in co-producing the very first VetsAid Job Fair that took place the morning of the concert at their Millgard Work Opportunity Center in Tacoma. More than three dozen solid job offers with a sustainable living wage were made as a result of that morning’s efforts and VetsAid hopes to continue the tradition in the future. A former resident of Ventura County himself, Walsh also disbursed a $10,000 grant to the Veterans Fund of the Ventura County Community Fund in Ventura, CA in support of that community’s struggles after the Hill and Woolsey Fires. Providing support to organizations that care for America’s veterans as well as their families is deeply personal to Walsh, himself a Gold Star survivor whose father died while on active duty on Okinawa, Japan when Walsh was just 20 months old. Additional event details to be announced.